While Apple is generally known for their cutting edge software with an elegant design and implementation, it appears as if there’s an Apple calculator problem on both macOS and iOS. While it may seem relatively simple to implement a calculator that can accomplish some basic functions, there’s actually a good amount of programming that goes into providing a calculator for iOS and macOS that provides reliable results each and every time. While the utility works without a hitch the majority of the time, Piunikaweb reports that there are certain situations in which there’s an Apple calculator problem in the way that it interprets mathematical logic. The Apple calculator problem essentially boils down to the macOS and iOS implementations interpreting some mathematical functions in a different way than some equally respected models such as those from Microsoft. This can be a major problem, as many rely on their computer or phone’s built-in calculator functionality in order to get work done – a task that can be impeded and sabotaged by an Apple calculator problem. The Apple calculator problem was originally spotted by ex-Apple employee Ryan Jones, who provided evidence of the issue on Twitter. Without getting too technical, the Apple calculator problem arises when entering an equation into the macOS or iOS utility such as “100/20%”. When this problem is given to the macOS Spotlight software, you’ll receive a result of .05 as the result. With the majority of other calculator software, however, you’ll get the answer as 500. Following the reveal of this Apple calculator problem, there was a good amount of discussion about what exactly was causing the discrepancy and whether Apple or their numerous competitors was correct in the answer to this specific equation. One interesting tidbit that came to light regarding this Apple calculator problem is the fact that the answer to the equation seems to differ across versions of macOS. With Ryan running the latest version of the software on their system (10.13.3), he received a result of .05, while fellow tester Nick Arnott got the answer of 500 on a macOS 10.13.3 system. This discrepancy seems to indicate that something went wrong in the updates between 10.12.6 and 10.13.3 that cause an Apple calculator problem – an issue that Apple will hopefully address expediently moving forward. On mobile, The native calculator app on iOS provides an answer of 500, while Siri gives the answer as .05 – a bizarre Apple calculator problem with a major disconnect between the built-in software and the virtual assistant’s take on this equation. These glaring errors are no doubt a problem for iOS and macOS users, as getting two different answers – with one far removed from the results given by other utilities – can lead to some pretty inaccurate calculations, potentially throwing off data and other work by a large margin. But how can their be two answers? It all comes down to how the calculator interprets the equation, which is somehow different due to an Apple calculator problem causing a disconnect across multiple programs. Put simply, if you interpret 100/20% as (100:20)%, such as the way Siri and Spotlight do – you’ll get an answer of .05. Otherwise, the answer will be 500. In order to see what other respected calculators gave as the answer to this seemingly simple equation, Piunikaweb plugged the calculation into other online and system calculators in order to get other companies’ take and see whether it was truly an isolated Apple calculator problem. 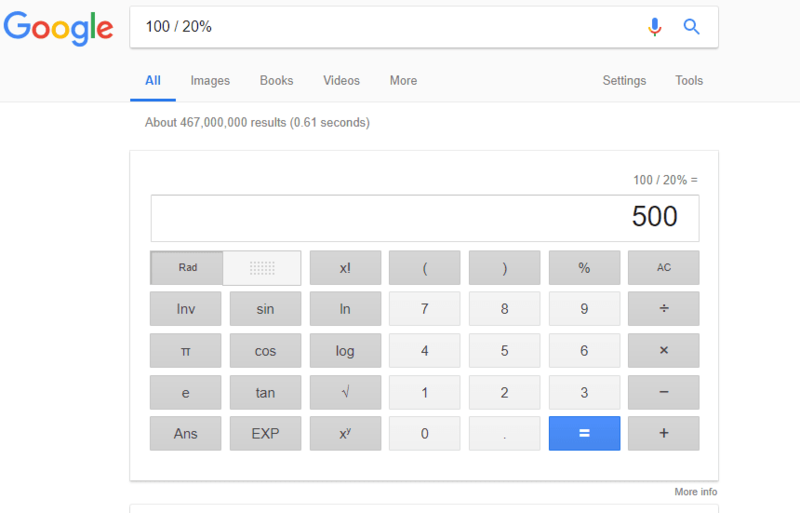 Google’s calculator gave a result of 500, as did calculators on Linux and Microsoft Excel – seemingly backing up the suggestion that there’s an Apple calculator problem that urgently needs to be addressed. Long story short, be careful when plugging equations into iOS and macOS if you’d like to avoid an Apple calculator problem.